Tourism is a major source of income for Spain and is the theme of this self-adhesive stamp issued with a postal rate valid for mail to Europe. Tourism in Spain took off in the 1960s, mainly due to improved infrastructures and the increase in the income of the middle class. To promote the sector a Subsecretaría de Turismo (Undersecretary for Tourism) was established in 1962 and shortly after the Institute for Tourism Studies and the Official School of Tourism were set up to train the professionals of tourism who from then on were to have such an influence in the development of the sector. In 1982 the Government decided on the creation of a new image for the overseas promotion of tourism and turned to painter Joan Miró to design the famous "Sun of Miró". This logo was given to the government for free and since 1984 has been used by the General Secretary of Tourism on its brochures, posters and publications. According to experts, this logo has been the best at capturing and representing the image of tourism of Spain. 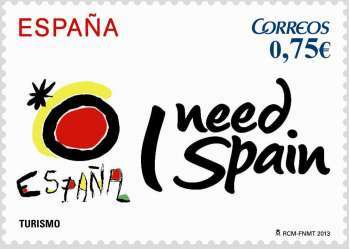 In early 2010 the new official logo "I Need Spain" was introduced as a variation of Miró's sun. The aim of this new design is to renew the brand image of Spain associating, on the one hand, a characteristic lifestyle as a differentiator of tourism in this country and, on the other, the portfolio of products to be promoted. Philately, acknowledging the importance of tourism, issued in 1990, a stamp devoted to the "European Year of Tourism" depicting the famous design of Joan Miró. 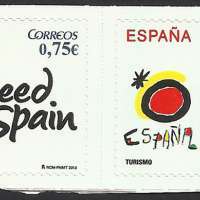 On this occasion, the stamp is illustrated with the official logo of the Tourism Institute of Spain (Turespaña), "I Need Spain". This institution is responsible for promoting Spain abroad.